This listing is for 1 Leopard Beige Head Rest Cover. This is a great way to personalize and protect your head rest while you are in the vehicle. 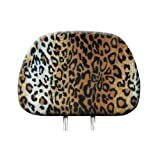 This head rest is made with quality material and has a beige leopard design. It is a great addition to any personalized vehicle. This head rest cover is machine washable and will fit most head rests. If you have any questions, please contact us via email. This listing includes 1 headrest cover for car truck and vans seats. The headrest cover will fit most standard headrests on most vehicle’s seats. This product is manufactured by U.A.A. INC. Exclusively sold by Unique Automotive Accessories. To insure the highest quality and authentic product please make sure you are purchasing from Unique Automotive Accessories. Please report counterfeit as this product is covered under US trademark/patent.